I may have said this previously, but we don’t talk about the Death Metal scene in France enough. It’s a shame we don’t talk about Death metal from France more because the it’s every bit as heavy and intimidating if not more. IN SHADOWS AND DUST (a name taken from a KATAKLYSM song) have a thick fog of dissonant strings that lay thick over the blast beats to create an alien and unwelcoming environment that feels and sounds like getting caught in thousands of mechanical teeth that rip you to shreds. Enlightened by Darkness is like a frightening bird of prey of unfriendly beak and unsympathetic beady eyes as it clutches your weak frame back to its nest to be devoured. More intriguing is the fact that IN SHADOWS AND DUST’s music was created and performed by a single dude. Stephane Thirion has been putting out quality Black Metal material since Spring of 2015. 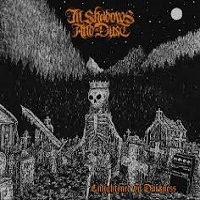 With lyrics that draw on discovering a more edified knowledge through studies of black magic and occult practices, IN SHADOWS AND DUST encourages to look for your own answers to the harder questions of life in songs like “Enlightened by Darkness” and “Looking into the Void”. Stephane creates a hostile environment for insecurity and cognitive dissonance to thrive, and gives you a large, bitter dose of reality. But don’t think IN SHADOWS AND DUST is nothing but nihilistic hopelessness. “Dawn of a New Day” is the only comforting star in a night so black. Stephane’s inspiration for Enlightened by Darkness was mostly taken from his own dark mind recesses and traumatic experiences, and from his general attitude towards people today. Enlightened by Darkness aims to shake your old, toxic mindset that has been poisoning you for years and you’ve barely noticed a thing. This is an album to send you rocketing either too or from the impenetrable darkness depending on how you look at the lyrics.